Originating from the volcanic regions of Japan, Japanese Knotweed (Fallopia japonica) is a giant weed which thrives on disturbance. It uses this attribute to spread down watercourses, along transport routes and on to waste land. The plant itself is a perennial. Consequently, it will re-establish itself year after year and spreads via an extensive underground rhizome (root) system. This can grow underground for up to 7 metres laterally and 3 metres in depth according to Environment Agency guidelines. It then uses this root system to grow up in other places. Nimrod Environmental is highly experienced in Japanese Knotweed Removal and Eradication. Our services range from undertaking site surveys to chemical spraying and soil excavations. 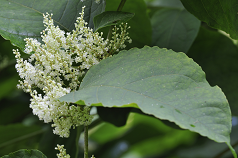 You can use our guide to help identify Japanese Knotweed or call us to discuss your Japanese Knotweed Removal requirements. Furthermore, we will be happy to advise you over the phone. If you would prefer to complete our online form then you can find it here.